Budget speeches. 95 year old falls victim to the cuts. “The process for the budget meeting is that the main and only motion consists of formally proposing the budget for 2014/15, which has been worked up by the Labour administration and recommended by the all-Labour Cabinet. All the political parties then put amendments. Obviously Labour’s amendment is unlikely to propose anything radically different from the main budget report and in practice the opposition parties accept the bulk of the Labour proposal but suggest some changes – typically savings and spend to the tune of a few million pounds, a small fraction of the total budget but an indication of their political priorities and what they would be working on if they were in administration and could direct officers to work up reports and projects. On this occasion (March 2014) the budget report allowed for a 1% increase in Councillors’ (Members’) allowances (currently £11,700 for back benchers). It was therefore open to all parties to continue our pay freeze for a fourth year and use this money for something else. The Green Group, Cllr Rob Murphy and myself, were happy to accept this pay freeze but I felt that it should not be decided in a highly politicised, public, arena with each party making a “blind bid” over their position and what to spend the money on. Members’ allowances are part of our terms and conditions – being a councillor is a job! – and should be discussed between the party leaders in the Corporate Members Group, as it always was when Jan Wilson (Labour) and Paul Scriven (Lib Dem) were leaders of the council. I feel very strongly that there are some issues – constitution, terms and conditions, some practicalities of how the council is run – which should be decided by the whole council, not simply imposed by the administration (though in practice they have a large majority on the Corporate Members Group and can decide what they want). We therefore included a clause in our amendment to this effect, directing that, in the event of agreeing to a pay freeze we would contribute the freed up £12k to the Voluntary Sector Grant Aid budget. Cllr Ben Curran chose to interpret this as saying that the Green Cllrs wanted a pay rise. Another interesting thing about his speech is that he criticised our amendment before we had presented it. Labour decided some time ago not to limit the length of debate for a given motion at Full Council, and in fact this has always been the case at the budget meeting. But traditionally (since the Greens became a group) we have “moved business” to allow the two opposition groups to present their amendments. The order in which councillors give their speeches about an agenda item depends on them indicating to the Lord Mayor, who keeps a list and works through it. He or she continues working down the same list even when the first and second amendments have been voted on and we move to the next amendment. 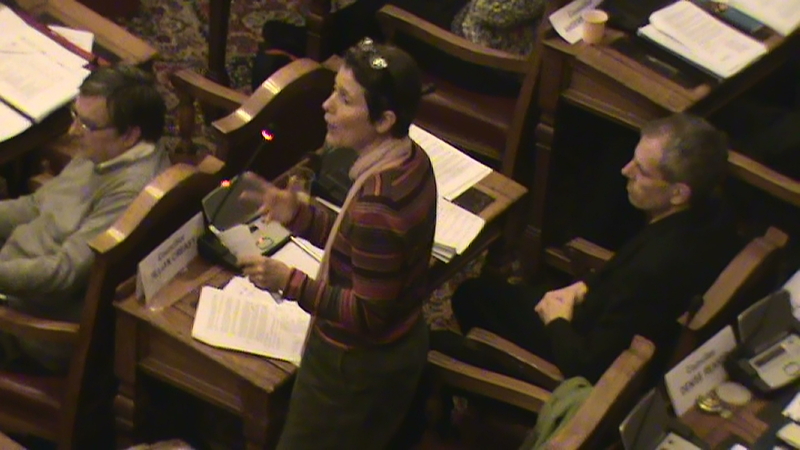 It is noticeable that many councillors simply make the speech they had planned whenever they speak during the afternoon. I assume Ben Curran had one speech to propose the Labour amendment and another to criticise the Green amendment and decided to give the latter even though we were still discussing the Lib Dem amendment at the time. There is little sense of people listening or responding to each other, except for immediate cheers and jeers. The idea that motions or amendments or speeches might influence the vote is utterly alien. There are 2 Responses to Budget speeches. 95 year old falls victim to the cuts.